Scouting is: Fun with a Purpose, and the purpose is to raise boys who respect themselves and others, and who have strong character. There is no better youth leadership nor community service training than Scouting. 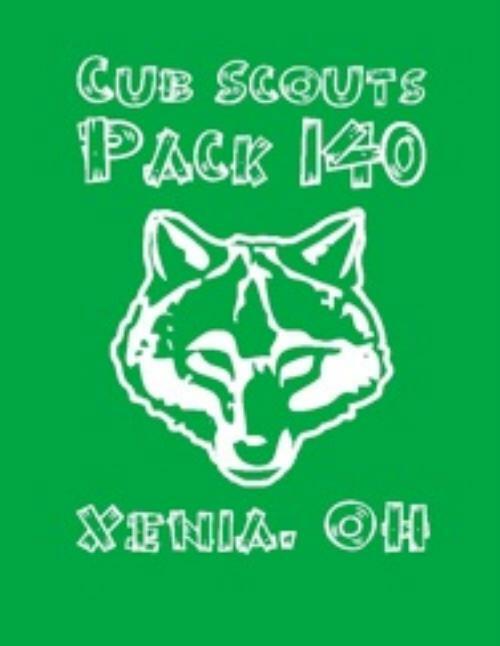 Cub Scout Pack 140 in Xenia, OH is dedicated to a lively Cub Scout experience with activities that capture the interest of boys yet are fun for the entire family. Pack 140 is open to all 1st through 5th grade boys regardless of school attended or preferred place of worship. Our cubs mostly attend St. Brigid Catholic School, but a few attend other schools in the area. St. Brigid Catholic Church sponsors our pack and provides facilities for us to meet. We've been continuously chartered at St. Brigid for the past 20 years!. How We're Organized - Our pack currently has about 20 boys organized by dens. Each den optimally has 6 to 8 boys of the same grade level. Dens are a great way to make and stay in touch with friends. Boys may join at any time in any grade - it's never a bad time to join! Our leadership is a labor of love by mother and father volunteers, and even a few grandparents! Single parents are welcome. Our affiliations - St. Brigid Catholic Church of Xenia, Ohio sponsors us. St. Brigid is on Fairground Road, just Northwest of the Green County Fairgrounds in Xenia. Pack 140 is in theChillicothe District of the Tecumseh Council, Boy Scouts of America. Religious - Scouting emphasizes the value of religion, but does not mandate adherence to a specific faith. The National Catholic Committee on Scouting and many other denominational Scouting organizations provide multiple religious emblems programs for Cub Scouts; over 75% of our scouts earn these awards with their families outside of Den and Pack meetings, and are recognized in special ceremonies at their places of worship. We are Not Exclusive - We welcome boys and families of all backgrounds. We are Not Day Care - You should plan to attend the meetings and events and be with your son. Cub Scouting is generally not meant to be a drop-your-son-off activity. Our activities are parent / son oriented. Parents provide our pack and den leadership, and everyone is expected to do their part to help run pack and den activities. Advancement requires active adult assistance. One of Scouting's biggest benefits is the structured exposure to skills and practical knowledge needed in family, career and community. The youngest Scouts can earn recognition for achievement in Family, Den, or Go-See-It activities. They participate in all scouting events with an Adult Partner (usually Mom or Dad). As Scouts grow, they continue to learn essential skills and enjoyment of outdoor activities, community involvement, personal safety, sports, and the environment. They earn emblems of recognition as they progress throughout the Cub Scout achievements and electives for their age group. All Scouts can also earn recognition for 23 different sports accomplishments including virtually every ball sport plus skating, fishing and swimming. Webelos are the oldest Scouts and they can earn 20 pins signifying their proficiency in Physical, Mental, Community, Technology, and Outdoor activities. The Webelos program prepares boys to work more independently and to join Boy Scouts near the end of the fifth grade. During the school year, dens meet between two and three times a month and also plan several field trips per year. Parents usually take turns organizing the den meetings and field trips. Our Pack meetings are usually the last Tuesday of every month, and feature award recognition and fun activities. Pack 140 loves to get outdoors! Cub Scouts have many opportunities to enjoy camping and the great outdoors. Each summer, Day Camp provides five packed days of fun-filled games, crafts, shows, and activities. Camp Birch also provides an overnight camp experience with tents and cots. In addition, we usually have at least one family campouts and hikes planned for the entire pack. Pinewood Derby - Cubs build and decorate 7" pinewood cars and race them down a 32-foot ramp, a classic event that's fun for all. Service Projects - Cubs collect canned goods for the Greene County Food Bank as part of the annual Scouting for Food Drive. Pancake Breakfast - One Sunday each spring, Pack 140 prepares a fundraiser pancake breakfast at St. Brigid after the morning Masses. Registration Fees cover national registration from Fall to December of the following year. An optional $12.00 covers a subscription to Boy's Life, the national Scouting magazine written for boys. Registration occurs during our Cub Scout Registration Night, so please bring your checkbook! Pack Dues cover supplies for pack meetings, major events, and awards throughout the year. Dues and Registration Fees are adjusted annually, but usually are in the $80-90 range. Fundraising - The annual BSA popcorn fundraiser provides much-needed funds for our pack and local council - the more we sell, the more we can do! Uniforms and Handbooks are required. Uniform cost (minimum: shirt + belt) varies depending on age level ($30-40/scout). Handbooks and most of the uniform's patches are provided by the Pack. Camp Fees are charged for day camp and overnight camp ($25 - $145 per camp, depending on camp attended). Scholarships from the council and Pack 140 to offset these costs are available for any boy who needs one. Please see the Committee Chair, Cubmaster, or Treasurer. Print & complete (or request) the BSA adult and youth applications. Complete the Pack 140 Registration Packet. Adults, take the BSA Youth Protection online training. Print your certificate. Adults interested in leading, take the Archdiocese Child Protection class and background check. We hold a Cub Scout Registration Night soon after school starts every Fall. Alternatively, submit the forms, certificate, and fees to the Cubmaster in person, by mail, or dropping them off at the St. Brigid School Office, marked for Pack 140..